This is one of our favorite LEGO builds of all time. We're impressed with ourselves when we can finish a 100-piece LEGO project with our kids. 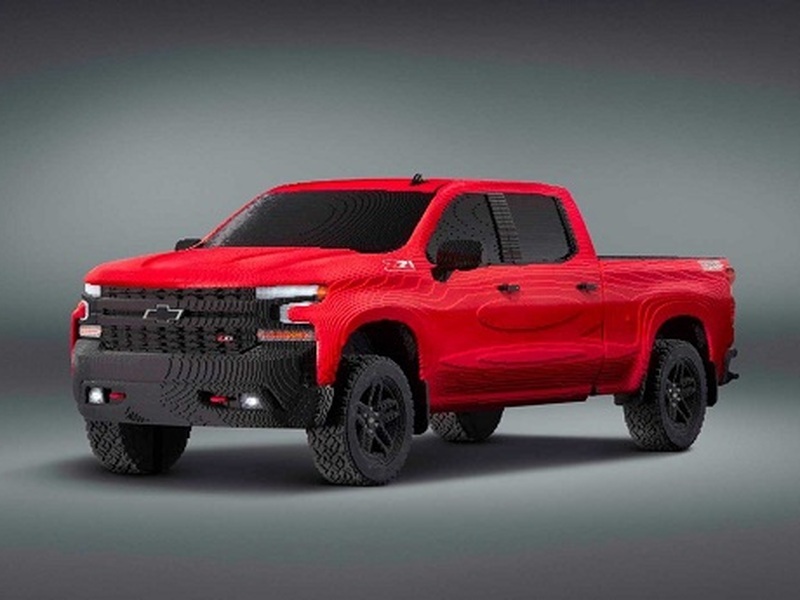 This 334,544-piece LEGO Chevy Silverado Trail Boss is considerably harder. This life-like beast was built a LEGO model shop in Connecticut, and it took the work of 18 people for an astounding 2,000 hours (that's an 8-hour work day for 250 days). Even the freakin' wheels and tires are made of LEGOs, the lights work, and the body decals are LEGOs, not stickers. LEGO has done up some serious life-like vehicles in the past such as the LEGO Batmobile from the LEGO Batman Movie, the driveable Bugatti Chiron, and even a Toyota Camry that took more than half a million pieces. Why the Camry was chosen, we really have no idea. At least it's the redesigned version and not the last-generation car that was as exciting as a slice of white bread. The Silverado shown here is true to form since it's the same size as the real truck and has all the design features such as the stylized headlights, the bold black grille, the hood creases, the body contours, and even the properly shaped tailpipes and red tow hooks. It's really quite remarkable that they were able to pull off this much detail. Though we know we'll never get to test drive this one, we did get behind the wheel of the new 2019 Chevy Silverado in various trims and found it attractive, seriously capable, and easily the best Silverado to date. Pickup trucks are getting more attention than ever thanks to solid build quality, better on-road driving manners, tremendous levels of comfort, and cutting-edge technology. It's no surprise that one finally got build as a full-sized LEGO vehicle.